Emails can now be routed based on the CRM customer field of picklist type. For example, if a company wishes to prioritize their premium customers and offer to assist them quickly, agents can prioritize and route the emails from customers based on their account type, say Platinum, Gold, and Bronze. Emails received from Platinum customers can be routed to a dedicated queue for faster processing. Using the Check Picklist object in the email script, you can filter emails based on the customer type and send them to their respective queues for better customer experience. To take advantage of the check picklist object, you must first define the desired Customer field of picklist data type in the Local CRM and then select this field in the email script. Use the default customer type field or create a new customer field in the Local CRM and then utilize it in the email script. Go to the Fields > Customer Fields tab. Select Pick List for the Data Type. Enter the Field Properties such as Field Name, Display Label, Pick List values, etc. See how to Configure CRM Fields. Scripts are grouped by media in separate tabs: Phone, Chat, Email, and Social. Find the email script and while editing the script, open the Script tab. 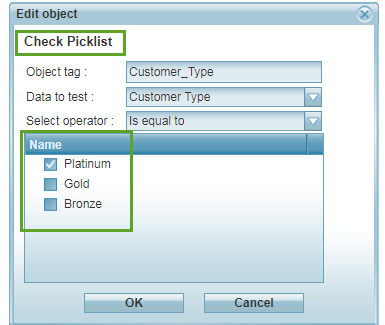 Click to add the Check Picklist object. Select your picklist field to evaluate and click OK. The check picklist is added to your script with the exit points matched or not matched. 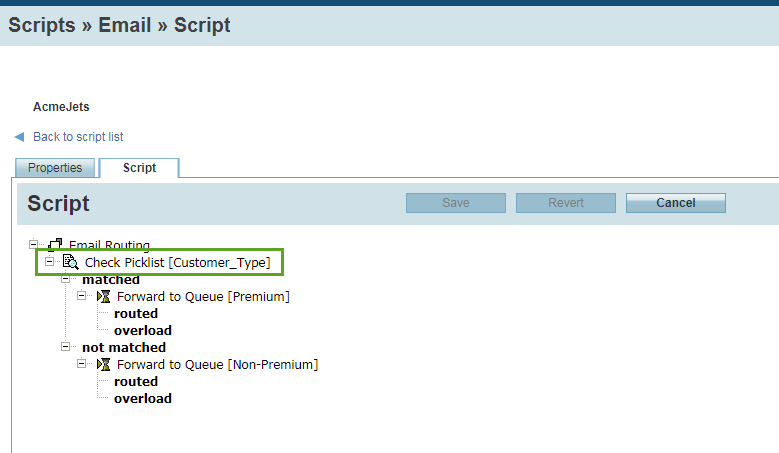 Define the routing options when the customer data is matched or not matched.